Okay, I was all excited about playing with the new stampin' goodies, so I could show you all a teaser, right? Well, first off, one of the stamp sets I ordered appears to have disappeared. I don't know where it could possibly be. When I unpack that carton of goodness that Mr. Brown delivers (on a too regular basis, lol), everything goes into its rightful place, and it was no different with that clear-mount stamp set. Arrrrggghhhh! Not finding it is driving me crazy and, believe me, that's not a very long drive! Oh, well, here's one sneak peek for ya. That little peek above is the Christmas Postcard single stamp that is divine. Such a lovely, old-fashioned, vintage Christmas feel, and perfect for coloring! 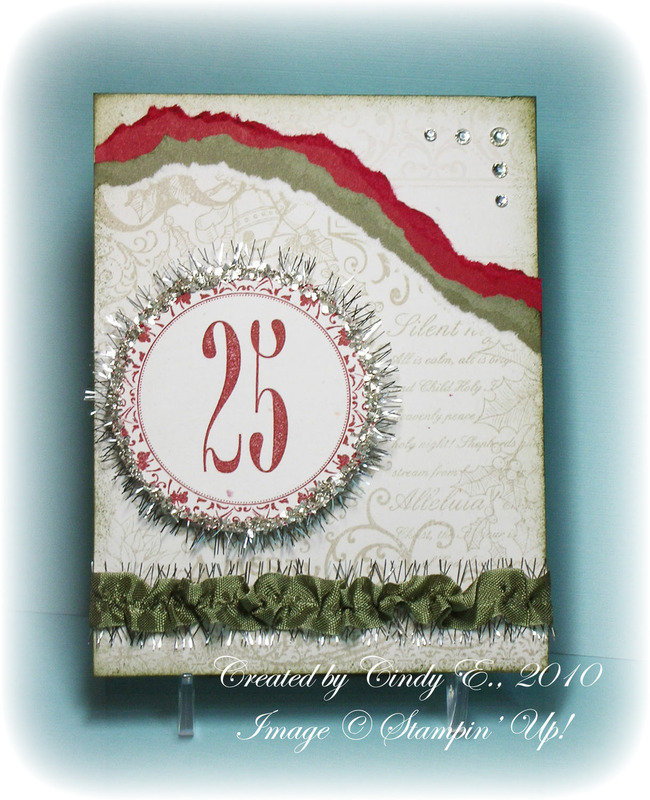 So, since I couldn't use the set I had originally planned, I pulled out the Christmas Collage background stamp. It has a lot of the same elements in it, all in a collage (*snerk*, hence the name, 'eh?). After I completed the card, I just wasn't thrilled with it. I couldn't put my finger on it, but it was just "off". It's better, I think. Still far from my favorite card evah, but definitely more balanced and pleasing to the eye. Oh well, I guess I can't hit a home run every time, huh? But I can keep trying! There is a new blog hop coming that will be featuring these goodies and much more, from the soon-to-be-released 2010 Holiday Mini Catalog! I'll be showcasing Jolly Bingo Bits. Intrigued? It will run from Friday 8/27 through Sunday 8/29. You won't want to miss it!!! Items from the new Holiday Mini are highlighted and will be available September 1st. A transformation from good to great! That's always a good lesson to see. Nicely done....I love the addition of more Cherry Cobbler! Good to Great indeed!